Icy-cold air and falling snow are bad excuses for putting away your chainsaw. Chances are, you still need to cut some wood to keep yourself toasty throughout the winter. But what should you be doing to make winter cutting easier? Surely the cold weather will have its effects on your chainsaw. How can you prevent problems from thickening oil and struggling starts? Just follow these easy tips. Keep sawing, no matter what the temperature, and, rest assured, you'll have enough fresh firewood to get you through the season. No matter how well your saw is running, it still requires a stable operator to get the job done. Making sure you're properly dressed to stay warm and safe is an important first step to ensuring a successful winter wood-cutting project. While you may or may not choose to wear a helmet and face shield during summer chainsaw outings, it's especially important to wear these while winter sawing. The cold, dry weather will cause the wood to splinter more easily, posing a threat to your eyes and face. The brittle trunk of a dead tree can also cause it to crack and fall sooner than expected. Wearing a helmet and face shield will protect you from the flying and falling debris of winter wood. If you don't have a face shield, a ski mask can work in a pinch, and will keep your face warm in the process. In addition to face and head protection, you should always wear protective gloves, chaps, and boots. 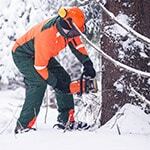 The beauty of sawing in winter is that these safety gear items will help to keep you warm and dry as well. Because cold temperature can cause your saw's oil to thicken, it's a good idea to switch to a thinner bar & chain oil during winter. This is known as a "winter grade" oil. Don't go too thin, but consider some of the chainsaw oils on the market that are designed for cold winter weather. Using thinner bar and chain oil will provide better lubrication for your chain. Just be aware that when you store your saw in a warm garage or shed, it may leak more easily. There are also some more eco-friendly options depending on where you're sawing. Vegetable oil has been said to make a great bar and chain oil for areas that don't allow petrol oils, and it's thin enough for winter use. Do your research and find the best oil for your saw and situation. It may sound funny to suggest keeping your saw cool in freezing-cold weather. 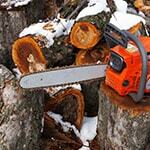 Yet, plugging the air intake with snow build-up can in fact cause your chainsaw to overheat. Periodically check the cool air intake and brush out any snow accumulation that could restrict air flow through the intake. Also beware that if your air filter gets covered with snow, you'll have some problems with air flow through the filter. As the snow melts on the filter, it gets saturated with water. Unlike fish, an air filter cannot breathe under water. Check the sprocket cover, too. Just as sawdust and oil can accumulate around the sprocket on a warmer day, ice and snow can build up around the sprocket during winter. 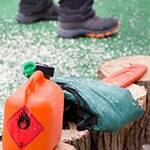 The addition of icy wet accumulation with the oil and sawdust can cause a serious problem for your chainsaw. While you're at it, keep a close watch on the chain brake. Some saws house their chain brake in the sprocket cover, offering a one-stop-shop for checking both your chain brake and sprocket at the same time. Others house their chain brake elsewhere, but it's still important to keep an eye on no matter where it's at. When you're low on gasoline and need to top off the tank, it's always a good idea to brush any snow or ice accumulation from around the fuel tank opening. As you likely know, moisture doesn't make a good fuel additive. Any snow that falls into the fuel tank during refueling can cause hesitation and sputtering of the chainsaw engine. Melted snow (aka water) is denser than gasoline, so it's pulled to the bottom of the fuel tank via gravity. From there, it goes into the fuel line where the saw tries to inject it like fuel. The problem here is that water is not combustible the way gasoline is, so it steams and doesn't ignite. This will cause the engine to sputter. Too much water will cause the engine to stop running and struggle to restart. If water is left in the fuel lines over time, it can cause rusting and other corrosive problems. Using a Chainsaw in Cold Weather - View Our 4 Tips for Using a Chainsaw When it's Cold. Our chain saw how-to library can help you pick the perfect electric chain saw, gas chain saw, pole saw or chain saw accessory.